The Board of Trustees of Essex Winter Series is pleased to announce two recipients of the 2017 Francis Bealey Memorial Scholarship. 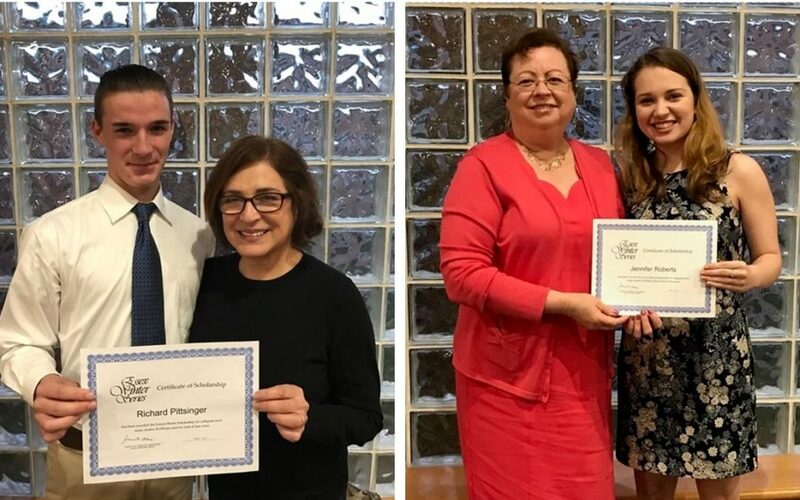 Jennifer Roberts of Deep River, daughter of Dean Roberts and Judith Reilly-Roberts; and Richard Pittsinger of Essex, son of David Pittsinger and Patricia Schuman, were each awarded a scholarship. Named for a founding member of Essex Winter Series, the Francis Bealey Memorial Scholarship is awarded annually to a graduating senior of Valley Regional High School (VRHS) who will be studying music in college. The generous scholarship provides $1,000 for each year of study, for a total of $4,000. The Scholarship was established in 1995 after the passing of EWS board president Francis Bealey to honor his commitment to music and arts education. Jennifer Roberts is attending the Roosevelt University Chicago College of Performing Arts as a musical theater major. A 2017 graduate of VRHS, Jennifer was a member of the National Honor Society and participated in several extracurricular activities, among them the VRHS Chorus, VRHS Musicals, VRHS Student Council and Interact Club. She studied dance at the Mulkerin School of Irish Dance, the Joffrey School of Ballet, and New Haven Ballet. Jennifer was selected to participate in the CT Music Educators Association, Shoreline Music Festival, and the Boston Conservatory Musical Theater/Dance program. Richard Pittsinger is attending the Julliard School as a vocal arts major. He graduated from VRHS in 2017 and was a member of the National Honor Society, the French National Honor Society, and captain of the Cross Country Team at his high school. He is also the recipient of the George London Foundation Scholarship for continued studies at precollege Juilliard and received the Carolyn Greenleaf Memorial Award at the Community Music School, as well as the Maestro Award at the Worldstrides Heritage Conference. Richard studied the St. Thomas Choir School for five years and attended pre-college classes at the Julliard School prior to his high school graduation.